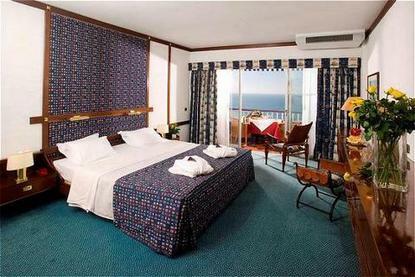 Hotel Algarve Casino seamlessly combines stylish Portuguese ambience and traditional Continental luxury. With 10 conference rooms for up to 350 people, a superb beachfront location and proximity to eight championship golf courses, it is the perfect place for leisure, business and golf breaks. 2 km to the city center, Railway Station Portim?o 3 km, Motorway/ Highway Exit Portim?o 5 km, Exhibition Site Expo Arade 2 km, Sagres Fortress 20.0 km, Praia da Rocha Beach & Marina 0.1 km, Museum (Museu Municipal de Portim?o) 2.0 km, Monchique Spa and Natural Botanic Park 20.0 km, Lagos Medieval City 15.0 km.